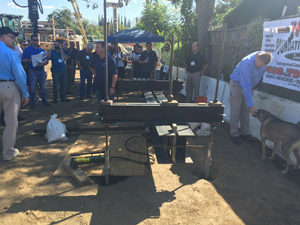 After a brief introduction, Dr. Cerato presented an eleven minute video that focused on the first of its kind seismic load testing of helical piles that was completed in March at the University of California San Diego Shake Table. The extremely high quality video led viewers through snapshots of some of the devastating destruction caused by earthquakes in California, Japan and New Zealand. This segment was followed by detailed video and commentary of the preparation and testing of (10) fully instrumented helical piles installed into dense sand in the laminar box. Dr. Cerato and her team installed GoPro cameras inside the top of the laminar box in order to capture the interaction of the piles, the pile caps, the loads and the soil during each test. The timeless phrase “a picture says a thousand words,” may need redefining upward in order to justify the scientific value of what these video sequences reveal. What’s Next for the Seismic Study? HPTC members are currently exploring several options to complete the remaining tasks and expect to reach a decision by mid October.